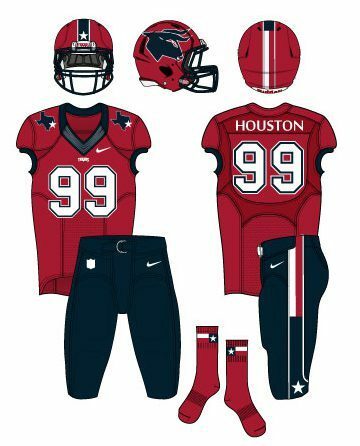 How Did NFL Rebrand Houston Texans Jerseys’ Look? The Houston Texans are entering their 16th season in the NFL. They are still looking at their first, THEIR FIRST, cheap Texans jerseys and logo design (unless you count adding the red jersey in year two of the team, which I don’t). Even when the league forces them to add a new “Color Rush” jersey, they didn’t wear them. So for 16 years if you’ve tuned into the Houston Texans you’ve seen the same three jerseys, same three pants and same three socks in some combination on the field. Before you say ‘they are trying to keep their jerseys consistent and in 30 year’s we’ll think they are classic, don’t change them. The great teams don’t change their jerseys’ just know you’re wrong. The Steelers, 49ers, Cowboys, and Patriots (most Super Bowl Wins in the NFL) have all made changes to their uniforms, logos, and style over the course of their history and even smaller aesthetic moves in recent years. This offseason the Houston Texans did something we hadn’t seen them do since their inaugural season, draft a quarterback in the first round. Now to do something they’ve never done, redesign their look. Their entire look. New logo. New wordmark. New secondary logo (yes the Texans actually have a secondary logo and it’s terrible). New uniforms. The whole shebang. I spent some time debating if they should keep their primary logo. It took about two minutes to decide they should not. I get the logo. It’s a bull that has some elements of the Texas flag in it. But it’s just blah to me. I think it can be done better. One thing I am not changing for the Texans is their colors. The red white and blue with a team name like the Texans is a must. The bull stays, but get a more Greek look. I really looked for a place to put a star on the bull, but nothing seemed to fit or work for the overall look of the bull. Shockingly I had a lot of trouble finding a way to make the eye look right. I finally settled on the more abstract eye shape. If I’m 100% honest with myself, this is my least favorite part of the new transition, but I still like it better than the current logo. I tried a couple of other bulls before I landed on this. I took the simple Dallas Texans (now Kansas City Chiefs) logo and modified it for this team. I love this look. It’s simple and clean and screams Houston Texans. Also a bit of a throwback to the team that used to have their name, since the team can’t do anything with real throwbacks to the Oilers, this is the next best thing. 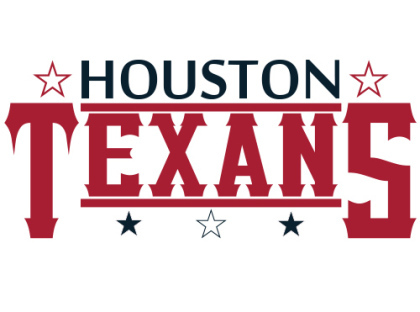 Something about this font (VanillaWhale) for the “TEXANS” I absolutely loved and felt like it has a “Texan” feel to it. The larger ‘T’ and ‘S’ framed the name well and balanced the overall wordmark (thanks to my buddy Cole for the suggestion). The stars do not have a real meaning other than incorporating them into the logo somehow (this is a team named after the “Lone Star State”) and one star didn’t work, so I went with five. Seven was too many. Three too few. “HOUSTON” is a bit simpler to counteract the dynamic “TEXANS” wordmark. I think it fits well on the “EXAN” and is obviously needed. I also think that with the primary logo having a predominately blue color, red needed to be the bigger focus for the wordmark so that the two can be used together. Doesn’t that look nice together? Yup. But now, let’s forget the thing that will be featured on hats and shirts and sandals and even women’s high-heeled shoes. Let’s get to what matters, the product on the field. I did three uniform variations. I did not do a “Color Rush” uniform because I hate that idea. I’ll address the biggest change first. The helmet. It’s now red. Red is used on only one other helmet in the NFL since the bills moved back to a white helmet. Washington uses their burgundy, but I don’t really count that as red, so it’s only the Chiefs right now that have a red helmet. We’re going with a bigger bull than typically you find on helmets (think Bucs big flag) that will wrap towards the back and touch the facemask. The stripe on the helmet is a representation of the Texas flag. Nothing says Texas more than this state’s great flag. It’s probably the second most recognizable flag in America. Also the “Texans” wordmark on the nose bumper (thanks @UniWatch) at the top of the facemask. My favorite thing is where the star falls on the helmet at the front. Just looks really good in my mind. Now to the uniform. Starting, obviously, with the home blue jersey. With a classic throwback sleeve stripe instead of the modified horn point they have now. “Texans” wordmark again across the chest which is fairly standard for NFL teams, unless you’re the Browns and want to have really ugly jerseys. White numbers and red piping jumps off the dark blue jersey, so even though it toiled with using red numbers with blue and white piping on the numbers the white just made the most sense. I am not a huge fan of a dark number on a dark jersey from a broadcasting standpoint, so we’ll save those for a future alternate maybe. Numbers on the shoulders as well. The pants are red with a matching stripe to the helmet of the Texas flag. Blue on red is the best look the Texans use now. Needs to be their regular home look. I actually did the pants stripe before adding it to the helmet and absolutely fell in love with the idea for the pants piping. 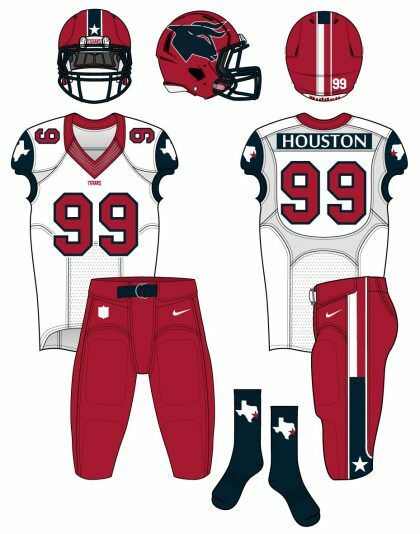 It might look a little gimmicky, but it’s hard to say the Texas flag doesn’t look good on the “Texans” football uniform. Great marketing as well for the second most popular team in Texas to try and infiltrate some of those Cowboys counties in the State. Texans love everything with their flag on it. The socks mimic the sleeve stripes. Socks are largely overlooked part of the NFL uniform. While baseball and soccer have always embraced the socks as a full accent of the uniforms, football almost largely ignores them. I think this is a good look for the home games. Same look as the home uniform, just switch out the pants for white and you have another look to wear at home. 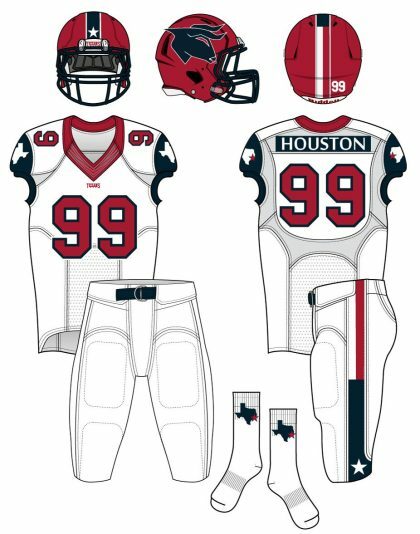 The Texans wore white pants at home for every game except for their Deep Steel Blue game against the Chargers in 2016 so I wouldn’t be surprised if this were the look they would wear more. This turned out to be my favorite uniform combination I came up with. I really like the blue sleeves with the secondary logo on them along with the blue nameplate on the white jersey. The NFL doesn’t use the alternate color nameplate much, it is seen a lot more in the NHL. The red pants complete a good red/white/red look which would unique for the Texans. They typically wear blue pants with their white uniforms. The socks bring the blue back into the color scheme a bit and show off the secondary logo again. The only thing loved as much as the Texas flag is Texans love for things with the outline of their state. 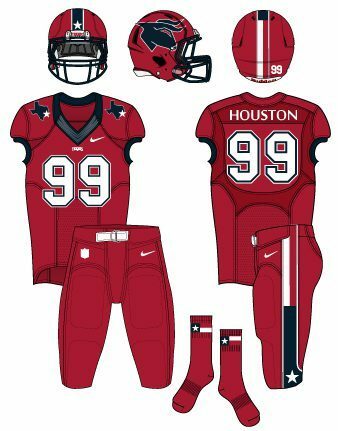 Of the current Texans jerseys, the red is my favorite. They wear it once a year. Luckily it’s been a while since they’ve worn them with red pants. This is a great look for their annual “Battle Red Day” near the end of the season. Secondary logo on the shoulders becomes a unique look for this one-off jersey. Texas flag also makes its first appearance on the socks. I would say the flag would wrap all the way around the sock, but I’d be fine with it just being on the outside. The Texans have a tradition of wearing all three of their jerseys at home. And I don’t mind their current style of three jerseys and three pants, interchange them as you wish. I think that should always be an option. If you start winning with one combination, don’t mess with it. Here are some different ideas on how they could mix and match the looks I’ve created. I’m on the record that I don’t like the unitard look, except white. White seems to be the only way to successfully do all the same color jersey, pants and socks. This would be a good look for the team’s first home game where they do a “Liberty White Out” every single year. There is enough color on the uniform that this doesn’t just look too clean. And now that they play on turf, now worry about grass stains to dirty this up and make the equipment manager’s job a nightmare. This is too much red. The Chiefs actually pull this off nicely but we’ll go ahead and let them be the only team in the NFL with this look. I hate this and would hope they would never do it, but wouldn’t be surprised if it popped up once in a while. Another gimmick jersey game the Texans do is their “Deep Blue Steel” game where they wear blue on blue. I actually like the flip on the socks color and don’t mind the blue on blue look once in a while. The red socks look a lot like the Red Sox style, but it breaks up all the blue. They could wear this with white socks as well. But not a bad look. 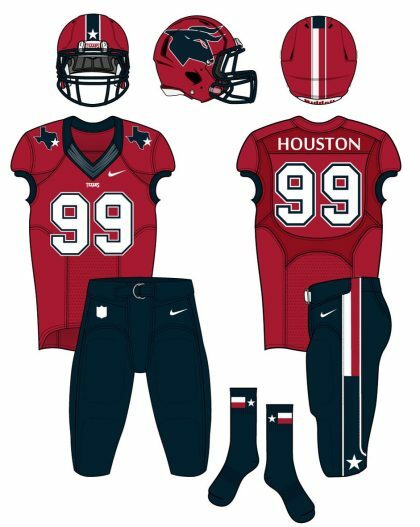 Like I said above the Texans typically wear their red jersey with white pants. 2016 was the first time we ever saw the team wear their red uniforms with the blue pants, so this seems like more of a possibility but isn’t nearly as good looking as the red on blue above. Wouldn’t hate these. Could put in the Texas state socks here too. 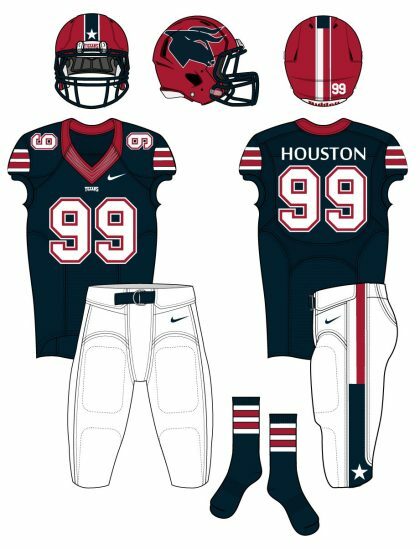 I actually like the red socks more than the blue with the blue pants, but maybe it’s too much red with helmet, jersey, socks. I’m still up in the air on this look. Still really like red on blue jersey pant combination. That is about all I came up with. I didn’t redesign the field or the cheer outfits, I’ll let the Texans figure that out. But I’m really happy with how this entire rebranding of the Houston Texans came out. It seems like the Texans are due for a rebrand. They need to do something, even if they are looking to just boost some merchandise sales. A rebrand can be very successful for a team that is still looked at like an expansion team with little to no success in the league despite winning four Division titles in the last six seasons. I wanted to show the progression I made with the primary logo as I worked on it. Here are some places I landed before making changes and eventually landing on my final product.